Gleason Reel® Cable Reel can be mounted to wall, ceiling or under work bench. Cast aluminum housing with baked polyester finish. Unitized 20 amp slip ring in gasketed enclosure. Easily accessible gasketed junction box. Spring housing and guide arm contains spring motor. 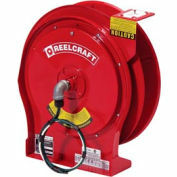 Spool configuration prevents lock-out and features a watertight cord grip. 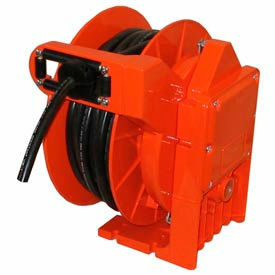 Field adjustable cord guide with four rollers and cord stop for smooth cord retraction and extension. Positive lock with field adjustable disengage. 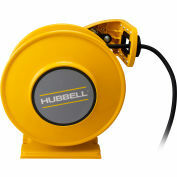 Maintenance free enclosed power spring. Includes type SO cable. 14/3c x 40'.